Our Licensing/Affiliate Program consists of only the most highly motivated and talented Krav Maga Instructors and school owners in the world. 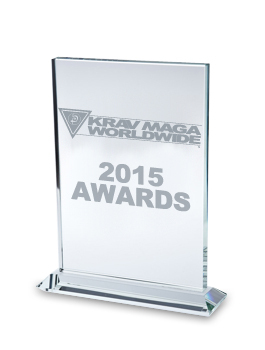 Every year Krav Maga Worldwide™ looks back to recognize and honor those individuals who have demonstrated a new level of excellence within our Licensee/Affiliate community by presenting them with a specialized award. These Awards recognize and honor individuals who have made significant contributions to the Krav Maga Worldwide™ Program as well as their respective communities. These awards are based on different categories for exceptional actions and achievements. Congratulations to our 2015 award winners and to the schools and communities they represent. Thank you for everything that you do. A Leader who builds his fellow instructors into better, more confident teachers, who demonstrates an exceptional understanding of the Krav Maga philosophy and fighting systems techniques and who commits to making one's community safer and stronger. In honor of the school that exhibits the highest standards of business acument in the facility and website design, staffing support, customer service and overall business model and plan for sharing and applying the principles of Krav Maga. For the instructor who demonstrates a tenacious spirit, determined mind and fearless heart, which embody the traits of renowned Krav Maga practitioner and mentor, Marni Levine (1969-2006). This award recognizes the resilient instructor who has overcome insurmountable challenges while exceeding the expectations of a Krav Maga practioner. For the instructor who demonstrates a deep and unwavering commitment to his or her growht and improvement in Krav Maga through consistent participation in Krav Maga Worldwide programs and events, enthusiasm for and dedication to the practice of Krav Maga and loyal support for the Krav Maga community as a whole. In recognition of an outstanding new licensee who exhibits true passion and drive to establish their school and become committed representatives of Krav Maga Worldwide by developing a dedicated team of practitioners in Krav Maga, and building an exemplary school model for growth. The program director who demonstrates outstanding service as an integral leader in a licensee's business through his or her oversight of the school's development and daily operations, and dedication to its staff members. Recongnizing the individual school's and extraordinary service and activism in the fight against cancer, by dedicating their time and resources to increase cancer awareness and honor Marni Levine's dream to find a cure. Recognizing your extraordinary service and activism in the fight against cancer, by dedicating your time and resources to increase cancer awareness and honor Marni Levine's dream to find a cure. Recognizing your extaordinary service and activism in your community, by dedicating your time and resources to those in need.